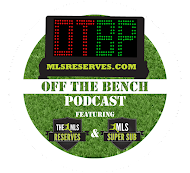 Off The Bench- The Official Podcast of MLSReserves.com hosted by Luke Lohr and the MLSR team. Talking all things Major League Soccer, NASL and USMNT/USWNT. Check it out. All In- Chicago Fire team writer Jeff Crandall updates you on all things Fire specific. High quality stuff, including player interviews. Best Soccer Show- Hosts Jason Davis and Jared DuBois discuss all aspects of soccer as it relates to America. Big Head Red Head - The Big Head Taylor Twellman and the Red Head Alexi Lalas talk all things soccer. This dynamic duo will have you simultaneously smiling and pondering as they discuss the big events of the week. ExtraTime Radio- Here the words of Greg Lalas, Nick Firchau, Simon Borg and Jason Saghini discuss the latest news in Major League Soccer and as it relates to American soccer. Fans of United- Deveon McTavish, Eric Hunsaker and Chris Wimmer offer their perspectives on all things DC United and soccer. The Footy Front- Sporting KC specific, check out this fan hosted podcast for SKC opinions, news and more. Inside the Crew- The boys in Columbus discuss all things relating to the Columbus Crew. JimmyConrad.com- Only the best from MLS veteran Jimmy Conrad's website. Mao's Football Show- A Cascadia show dedicated to the Timbers, MLS and abroad. Major League Soccer Talk- Christopher Harris discusses the goings on of MLS, WPS and USMNT. March to the Match- The West Coast boys of MLSSoccer.com have their own podcast now. Jonah Freedman, Matt Doyle and the Shin Guardian offer their perspectives on soccer in MLS and North American soccer. Men In Blazers- Michael Bennett and Roger Davies talk the beautiful game...while wearing blazers of course. NASN.TV- A site that compiles all sorts of soccer related podcasts across a wide variety of soccer topics. Also includes a daily video bit Mon-Fri.
Nos Audietis - A Sounder's focused podcast hosted by Jeremiah Oshan and Aaron Campeau. Oleary's Cow- Well it's a podcast called Oleary's Cow, but they have some fun talking MLS. Quakes Cast- An Earthquake specific podcast out of San Jose. Post Game and team analysis from passionate Quake supporters. Red Bull Rant- Three guesses what this one is about. The New York Red Bulls fans are treated to the thoughts and commentary of Jason Iapicco, Truman and Patrick MacDonald. Seeing Red - A podcast focused on the New York Red Bulls. Hosted by Mark and Dave, two knowledgeable and passionate soccer fans. Sent Off Podcast- Eric Wynalda and co. talk all things current in the world of soccer. They have a no holds barred approach, telling it like it is no matter who is in their sites. Well worth the time. Soccer Matters - Glenn Davis delivers his top notch analysis and thoughts on Soccer Matters. The Total Soccer Show- Daryl Grove, Taylor Rockwell, Josh Stankus and Albert Ottati are passionate USMNT fans who put together a quality soccer podcast about all things soccer. The YSA Report- In interesting, and brash podcast out of Philly that is Union focused. Passionate fans to say the least. The RSL Show- Scott Black and Chris Enger give their thoughts on all things RSL. Know a good soccer podcast? Let us know about it! Also, we're eager to share our thoughts and opinions with like minded fans of the game. If you need a guest on your podcast, we'd love to sub in off the bench.